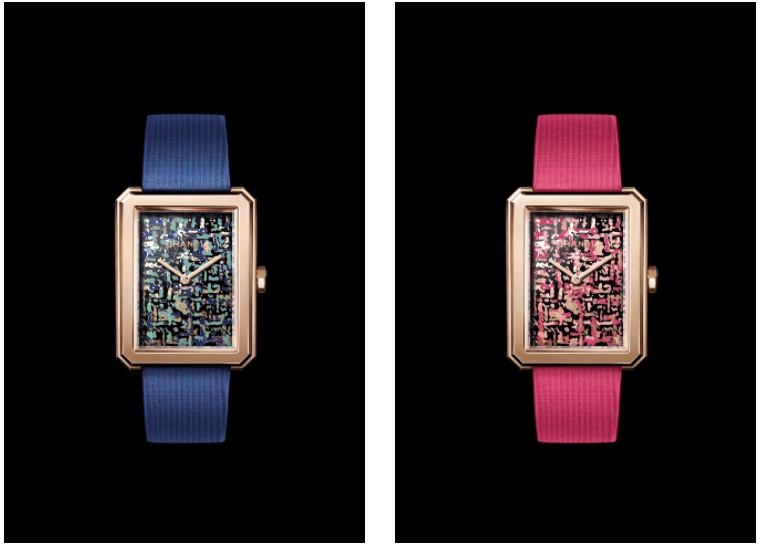 Having achieved iconic status in the watchmaking industry since its launch in 2015, Chanel’s Boy Friend wristwatch for women has been redesigned to feature a dial that looks like tweed, which is a highly significant fabric for the French fashion house. The new Boy Friend was unveiled at the Baselworld luxury watch and jewelry fair, which runs in Basel until March 26. Launched in 2015, the Boy∙Friend differs from Chanel’s other luxury watches in that it has an octagonal case and is inspired by traditional men’s clothing. This was very important to Gabrielle Chanel who often borrowed ideas from the men’s fashion world to design for women. Having given a tweed-effect strap to its Boy∙Friend in 2016, Chanel has shifted its attention to the dial, dressing it in tweed-patterned Grand Feu enamel. The selection of vibrant color combinations — pink, red or blue — is enough to brighten up any outfit. This latest Boy∙Friend, known as the Tweed Art, has an 18 carat beige gold case and bezel as well as an 18 carat beige gold crown and onyx cabochon. It has a colored satin strap with an 18 carat beige gold buckle. Chanel’s latest luxe timepiece is driven by a hand-wound mechanical movement. It displays hours and minutes, and it is water-resistant for up to 30 meters. It will be a limited edition of 20.